Technically, May is counted as the last month of Autumn - but Autumn in the sub-tropics is certainly not the same as Autumn in other parts of the country or the world! Do away with any idea that birds nest in the spring-time. They are nesting right now! My friend Helen phoned me a couple of weeks ago to tell me that there was a very tiny nest in a shrub right outside the window of her house. 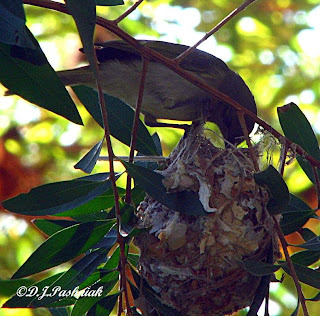 I was too sick to even want to go and look at that stage but when she phoned again the other day and told me that the parent birds - Brown Honeyeaters - were now feeding young ones I decided that it was time that I made the effort and started to get out of the house again. This morning I went and sat on her veranda and waited. The nest was in the shade and Helen said even later in the day it was still shaded. Brown Honeyeaters are always noisy birds and they have a range of calls. I listened and sat still while they scolded and made warning cries from close by. Then they came a little closer and made their more melodious calls and finally came closer still and made their little contact calls. Patience paid off and they eventually came in to the nest and clung to the branch and fed the babies. The branch the nest is attached to is very small and the adult birds set it swinging wildly as they clung to it. Brown Honeyeaters are small - only 11-15cms long. 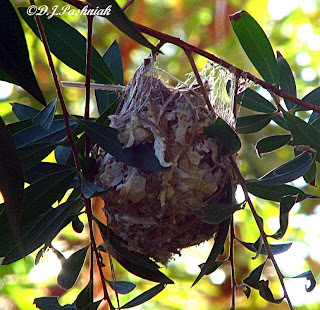 My bird book says that the Brown Honeyeater's nest is a deep cup of bark strips, grasses, plant down, wool, spiderwebs and cocoons. 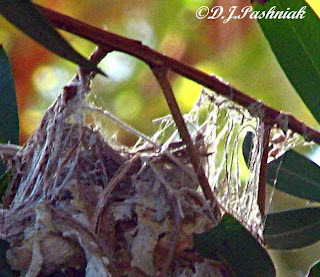 When I looked closely at the photos I had taken I could see the spiderwebs they had used at the top of the nest to help to attach it to the branch. Photo of the nest cropped to show the spiderwebs at the top. quite the elaborate basket they create for their wee ones! sorry to hear you've been so sick! i hope you are well on your way to mending! I've never seen a nest like that, very neat! Hi Texwisgirl and Martha Z. Thanks for commenting and glad you liked the look of the nest. It was so tiny and so well camouflaged. that is a very interesting post Mick. And I am glad your flu didn´t stop you from seeing them. Thanks for your comment NatureFootstep and thanks for your kind thoughts for me. Sounds like you haven't been too well Mick. Funny, but over here of course we think of Aussie as perpetually warm and sunny and I can't get my head around those seasons you describe. One thing for sure- keeping up the birding and photography makes anyone feel happier. What a lovely sight. I wonder how many species nest in Autumn instead of Spring. Hi Phil, in case I gave the wrong impression - it's all what you get used to. When I first came here 7 years ago I thought it was warm even in winter time. Since then I have become more used to the climate and definitely feel the cold more. I would hate to go back to a really cold climate! As soon as I can get out and watch and photograph the birds I know I will feel better! Hi John, I heard from a friend today that a pair of Galahs were back at the nest hole they used last year - so there must be lots more birds ready to nest again. I grew up with children's nature books written in England where all the birds nested in the spring and it is still a bit hard to remember to turn things around to Aussie seasons.